Assorted box of 12 bilingual feedback titles in English and French: SPLENDID - SPLENDIDE, VERY GOOD - TRÈS BIEN, WELL DONE! - BIEN JOUÉ!, KEEP IT UP! - COURAGE CONTINUE!, WONDERFUL - MERVEILLEUX, SUPER - FORMIDABLE, NEAT WORK - TRAVAIL PROPRE, GOOD WORK - BON TRAVAIL, BRILLIANT - REMARQUABLE, MUCH BETTER - BEAUCOUP MIEUX, MUCH IMPROVED - NETTE AMÉLIORATION, GETTING THERE - C'EST PRATIQUEMENT CELA. 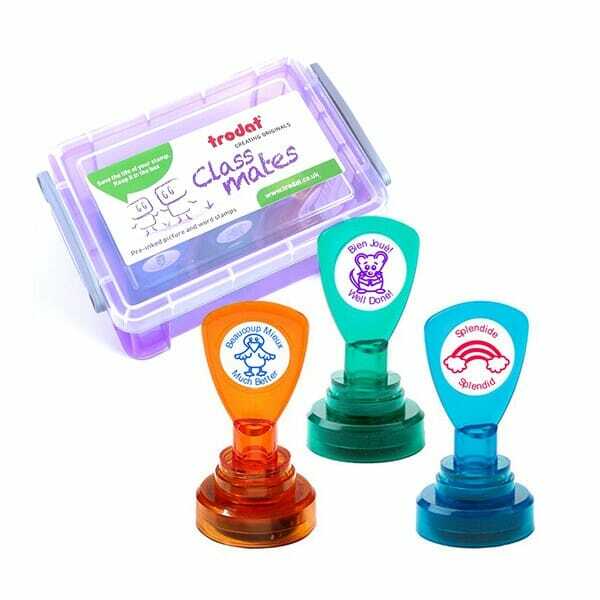 Customer evaluation for "Teachers' Motivation and Reward Stamps - Box incl. French titles"